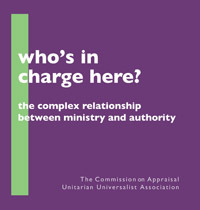 The COA summarizes the historical context of the relationship between ministry and authority as being about the "granting or revocation of authority to ministers" as a result of "the tension between religious principle and popular national sentiment." How this is the context for Rev. Hitchen and the East Lyndon Fellowship conflict over sermon talkbacks I don't know. The Commission went off track back in the discussion of the Cambridge Platform. Because they did not unpack the meaning of the authority of the minister over the "ministry of the word", the only thing that they could take from the CP was that congregations hired and fired ministers. Starting from there, they followed a "hiring/firing" thread through UU history, but ignored the hundreds of cases in which ministers were fired, forced to resign, or beaten into submission over the content and conduct of worship. What is left in our history are the cases of ministers who aroused controversy through their public ministry. And those conflicts were often with denominational officials and other ministers. The way that the Commission uses the phrase "granting and revoking authority" to describe three different kinds of conflict is confusing. Conflict between a minister and congregation over roles is not the same as conflict between a minister and the denomination over credentialing. And neither conflict is the same as the struggles for recognition, reputation and power among the ministers as a group. We love our self-image as a movement of heroic radical ministers challenging the powers that be. And we certainly don't want to be those prosperous Boston textile manufacturers and cotton merchants who cramped Channing's style. Nor do we want to be those awful denominational officials who tried to repress John Haynes Holmes. The historical context I want to know about is how that situation came about. Hi, Tom. Thanks for the great blog. I'm curious about the idea that there is intense frustration with our worship. Who are you hearing intense frustration from? (New congregants, old congregants, youth, visitors?) And when/where is that frustration being voiced to you? Our youth vote with their bodies. At least 90% leave our doors and never return. A curious result is that we are utterly unlike any extant tradition with deep roots; most everyone is a convert. Adults born and raised (or at least raised from early childhood) as UUs are rare in any congregation, a distinct minority. So our congregations function in a state of amnesia. They don't know their history, or the tradition's. It's all half-made up as they go along, plus the stirring stories that they hear, now and then. Servetus, Francis David, Norbert Capek, Emerson, Parker, Thoreau, Reeb. Oh, and Olympia Brown and Viola Liuzzo. They're frustrated, but don't know why, mostly. Some arrive, are taken by the freedom... and when they stay for the depth, find none offered (not that it doesn't exist, but the focus is so much on tending to the needs of newly converted UUs that there's no time or awareness of the ache...). We give our youth 100% permission to not go to a UU church when they grow up. As such, our youth are in the same position to our church as any other adult visitor--they can take it or leave it as it meets their needs. If our church met the needs of 10% of the American population, that would be massive growth. We would be thrilled by that.